I really like the look of this V-neck. 60/40 cotton polyester blend to make it super comfy. They run pretty true to size with very, very little shrinkage.. It provides a great fit. The design is printed on the front of the tee. You will love it! This shirt is stretchy and fits snug against your body. If you have a killer figure, this is a great shirt. This is not a good shirt if you have things you'd rather not show to the world. If I was a super model, I'd give this 5 stars because it IS really cute. This is one of my favorites<3!!! Love it very cute. Have it in pink and grey. 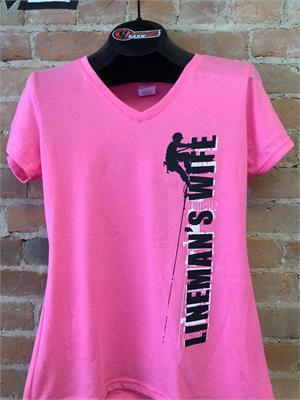 I am only 5ft and the length is perfect alot of shirts are to long but thease truly are ladies shirts. My husband just became a journeyman lineman and what a great way to show how proud that I am of him. This is an awesome shirt and I just love it. Thanks Lineman Barn for making a great shirt.